The domestic breed of rabbits is descended from the European rabbit Oryctolagus cuniculus. While these rabbits may often be found roaming feral and wild in Europe and Australia, the United States' wild rabbit population mostly only consists of various species of cottontails (Sylvilagus spp.) and jackrabbits (Lepus spp.). The only other rabbit native to the USA is the tiny Pygmy rabbit Brachylagus idahoensis. They are only found in parts of Montana, Idaho, Oregon, Utah, Nevada, and California. Isolated populations occur in Washington and Wyoming. Another example of a domesticated Agouti patterned rabbit Oryctolagus cuniculus. Photo © William Baldie. Used with direct permission from owner. Example of a wild European rabbit Oryctolagus cuniculus algirus from Conil, Andalusia, Spain. Image © /u/Foinz, used with direct permission. Feral rabbits are not wild rabbits. These are domesticated rabbits that have either escaped or been abandoned by their owners and have ended up fending for themselves without being helped or managed by humans in any manner. True wild Oryctolagus cuniculus rabbits have never been caught and bred selectively by humans. 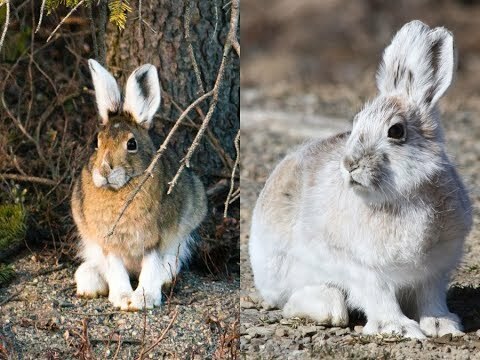 In many countries, domesticated rabbits cannot breed with native wild rabbits because they are a different species. The brown/grey agouti pattern of a wild rabbit can be similar to a domestic rabbit's but they are not the same. DO NOT feed wild cottontails, hares, and rabbits! This cottontail had to be put down because humans fed it only lettuce and carrots. It went completely blind from nutritional deficiencies. Source: Skye's Spirit Wildlife Rehabilitation Center. Can You Keep a Wild Rabbit as a Pet? Cottontails (Sylvilagus spp.) do not dig burrows, although they may use burrows made by other animals. Vegetation is used to cover the fur-lined nest between feeds. Cottontails are solitary animals, in contrast with Oryctolagus cuniculus, which live in groups with a defined social hierarchy. A rare piebald wild Eastern cottontail rabbit. With coloration like this he would not last long in the wild, he was sent to a wildlife rescue. Image (c) R.Carmody & used with permission. Jackrabbits, also known as hares, (Lepus spp.) typically live alone or in pairs and are native to Africa, Eurasia, North America, and the Japanese archipelago. Hares do not burrow belowground either and prefer to use a shallow depression or flattened nest of grass. Young hares are born fully furred and with eyes open. By contrast, cottontails and rabbits have young that are born blind and hairless. Hares are also generally larger than rabbits with longer ears and have black markings in their fur. Certain species of hares may also turn white during the winter. If you find a wild rabbit, please leave it alone and do not try to take it home as a pet. Wild rabbits do not belong as house pets. Wild rabbits are usually very nervous due to their innate instinctual fear of humans and do not adapt or handle stress well. They belong in the wild, and it is not a good idea to remove them from their natural home. As a wild animal, it may carry diseases that can transfer to your existing pets as well as people. In many places, wild animals cannot be taken care of without the proper permits. If you would like a pet rabbit, please consider obtaining a domestic breed instead. Some more reading about the differences between wild and domestic rabbits have been listed below. House Rabbit Society, Kate McGinley, Peter, Bugs, or Roger? Can You Tell a Cottontail from a Hare from a House Rabbit? A Bunny Named Squirrel, A Cottontail is Still a Bunny, Right? Individuals with roaming dogs may find it hard to keep a wild cottontail nest intact long enough for the babies to grow up. The following are some ideas on how to shield the nest yet allow the mother rabbit to visit and feed her babies. "I Found a Wild Rabbit..." poster used direct permission from The Wildlife Center of Virginia. "It's baby bunny season, so please remember, unless they are physically injured, leave them where you find them. Their mothers may only come to feed them twice a day, but they know where they are. Don't even touch them . . . Bunnies, bunny mothers, veterinarians, and wildlife rehabbers thank you very!" - Info/pic source, Dr A. of Ballston Spa Veterinary Clinic. If you find a baby wild rabbit that is not injured, leave it alone. It is most likely not abandoned unless you know for a fact that you killed their mother. Rabbits return to feed their young only once or twice a day for a few minutes, usually at night. Just because the babies have been by themselves for 5 minutes does not mean that they have been abandoned. The mother is typically gone from the nest to eat and draw attention away from the nest. Additionally, baby wild rabbits can survive on their own at a surprisingly young age. In most countries, it is also illegal to possess and take care of wildlife without proper permits. What To Do If You See A Rabbits Nest On Your Front Lawn by Ontario Wildlife Removal Inc.
PSA: Check for Bunny Nests Before Mowing Your Lawn This Summer by by Country Living Magazine. If you find a baby wild rabbit because your cat found it, take it to a rabbit-savvy vet or wildlife rehabber immediately. Cats have very lethal bacteria in their saliva and can easily be fatal for a rabbit in 48 hours. There is a 90% mortality rate with orphaned baby rabbits in human care, especially cottontails. This number increases if the rabbits are very young and their eyes still closed. They are extremely hard to "save". There is little substitute for the nutrients their mother's milk provides. Often they die of bloat, improper feeding or overfeeding. Many die even when people have done everything "right". 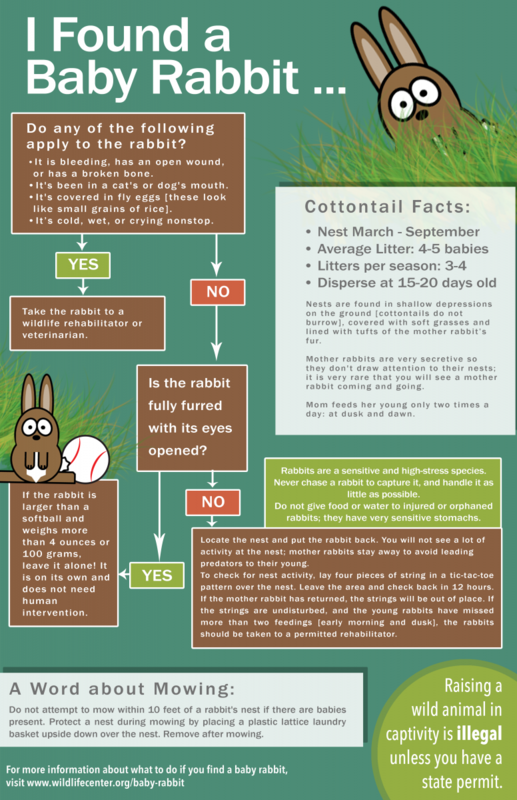 To determine how old a baby cottontail is and what your care plan should be, refer to this site. It is a myth that a mother rabbit, or doe, will abandon her babies purely due to another animal's scent on them. If you are doubtful, then wash your hands and rub them in the grass and soil around the nest before gently replacing the babies, making the nest up as it was before you disturbed it. Only her death or the inability to get to her babies will deter a mother from her offspring. If you find a nest that has been destroyed, you can move it or rebuild it to a safer area within 10 feet of it's original location. However, a continued physical presence of a perceived enemy can stress mother rabbits to not return to the nest to feed. Consequently, use third party methods such as crisscrossing unscented dental floss or leaving flour or unscented baby powder around the nest to detect whether or not a mother has returned to feed her young in the next 24-48 hours. A diagram showing how to determine if a mother rabbit is still visiting her nest. While touching the baby rabbit may not cause the mother to abandon her offspring, you may still transfer deadly diseases from your hands. Baby rabbits have very weak immune systems that have not been fully developed until they have been weaned after 4 weeks of age. Although they are very cute, wild baby rabbits are very easily stressed by handling and noise. Any undue stress can cause them to have heart failure. Observe, and please do not touch wild baby rabbits. In the case that you find that the babies have been abandoned, please use clean gloves or towels and wash your hands thoroughly. Contact your nearest wildlife rehabilitator that deals with rabbits and drop the rabbits off as soon as you can. If you do end up in the possession of a baby wild rabbit, do not feed any cow's milk, starchy vegetables like carrots, or any fruit. The milk of cottontail rabbits is much fattier (15% fat) and higher in protein (16% protein) than a cow's (3% fat, 3% protein). Additionally, a baby's digestive system is very delicate, and excess sugar can send it into dysbiosis. The links below contain more information about orphaned wild bunnies and how to care for them. Make sure that the wildlife rehabilitators accept rabbits before dropping them off. Typical animal shelters and vets will be unable to deal with wildlife without proper permits. Remember to also check your state department of fish and game for more wildlife rehabilitator contacts. ↑ The Mammals of Texas. (n.d). Desert Cottontail. Retrieved 22 January, 2016, from http://www.nsrl.ttu.edu/tmot1/sylvaudu.htm. ↑ Anderson, RR, et al. (1975). Composition of Cottontail Rabbit Milk from Stomachs of Young and Directly from Gland. Journal of Dairy Science, 58(10), 1449-1452.